Dragonchain showcased some pretty average performance during the month of July. We saw it peak around July 17th, when the price shortly reached 5688 satoshi. USD peak was reached a bit later, when the coin clocked in at $0,40 USD. 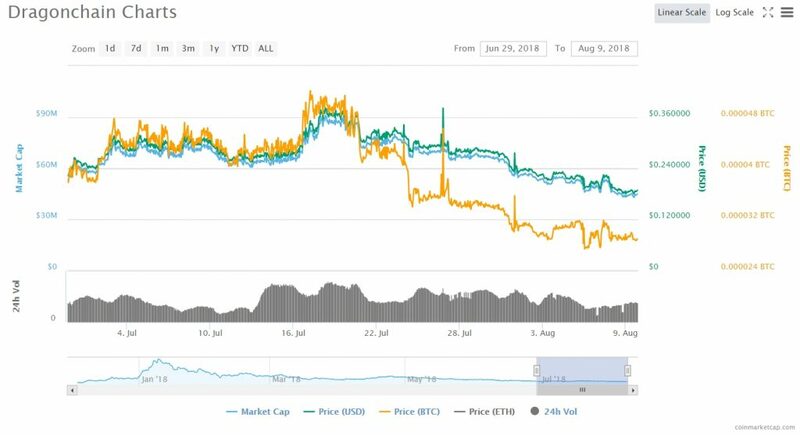 Ever since, it has been almost a continual lack of action, as the price reached the monthly lows of $0,230115 USD/2976 satoshi as July closed shop. August has been pretty much more of the same, as DRGN kept dropping to its current levels. Right now, one DRGN can be purchased for $0.167790 USD (12.06% drop in the last 24 hours)/2775 satoshi (7.51% drop in the last 24 hours). Daily trade volume sits at measly 189 BTC as Dragonchain sports a market cap of $40,773,170 USD, which makes it the 130th most valuable cryptocurrency in the world. A project that many would describe as “anti-hype” due to their general lack of marketing and promotional activities or updates, Dragonchain was originally created by Walt Disney Inc. in 2014. Starting its life off as a private blockchain under the wing of this company, the project officially separated from Disney and became an open source, public venture on August the 1st of 2018. One of its main purposes is to act as a bridging tool between public and private blockchains. They want to allow companies to create blockchain applications securely, easily and privately. Their product will be compatible with the development stack that companies are used to such as Java, C++ or Python, meaning that it won’t be required for them to master difficult programs like Solidity, Haskell etc. that have been known as the staple of blockchain development for a while. DRGN is the official currency of this ecosystem which functions as an incubator, a marketplace, a blockchain and a business platform at the same time. The main argument against DRGN right now is that the token isn’t really necessary for the platform to function; everything it does could have been achieved by using Ethereum or Bitcoin. Still, anything you do on the Dragonchain platform will require the tokens and/or DDSS (Dragon Days of Slumber score) which is built from holding Dragon tokens. The team is currently focused on achieving goals set by the official roadmap. While they claim that they aren’t focused on building up hype for the project (shown by their avoidance to “pay to play” on Binance), we recently saw them slightly contradict themselves by sponsoring a Nascar driver Corey LaJoie. The practice of renting their vehicles as ad space has been a staple of this sport for decades and DogeCoin is famous as the first blockchain related project that utilized this advertising avenue. The commercial side of the development is almost finished but the team is still expanding; there are offices being open in Seattle, Kansas City and one in an unspecified East Coast USA city. The new offices will be dedicated to working with potential clients of Dragonchain, looking to ease them in and help them develop their own product/currency on top of the native software. 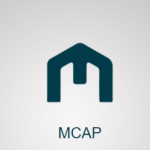 The actual marketplace where this will be made possible and most of the commercial infrastructure of the project are expected to be launched by late September. Check out our head to head look at Coinbase and Bitstamp. The first piece of the puzzle has been launched on August 1st, when the development team released the Dragonchain 1.0 commercial platform. The platform was switched from its alpha to a business-ready stage. Dragonchain 1.0 offers a Blockchain as a Service (BAAS) product, which allows users to build, test and deploy blockchain dApps based on smart contracts. Business (Approval) Verification, Enterprise Governance (Validation) Verification, Network Diversity Verification, External Partner (Notary) Verification and Public Checkpoint Verification are just some of the services that Dragonchain technology provides. The service is cloud-based and works on top of a hybrid private/public blockchain This allows users to selectively share parts of their data with a public blockchain, without risking the security of their private business data. The team will be visiting the Blockchain Seattle 2018 event, where they’ll focus on community building, education and showcasing of what Dragonchain has to offer. Among other things, they will be presenting the SlumberSwap application, officially the first app built on top of the Dragonchain software. Besides Joe Roets, Founder and CEO of Dragonchain, the event will have other notable speakers like John Roth (Chief Compliance and Ethics Officer at Bittrex), Lindsay Nuon (Co-Founder of Stranger Labs), Peter Wilson (VP of Engineering at Blockchain.com) and many others. So while the platform has so far been focused on development, the final touches are being put on the commercial infrastructure of Dragonchain. This means that the development stage has been nearly completed and the team behind the project should start re-adjusting their priorities. We should expect to see them ease on their “no hype” stance and start getting the word about the project out. Right now, KuCoin is the biggest platform that’s currently trading DRGN; a bigger exchange adopting it will be instrumental for both the token’s price and adoption. It remains to be seen how the market will react to Dragonchain and if the hybrid public/private blockchain idea has the potential to survive in a world heavily split between centralization and decentralization. 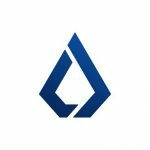 Lisk (LSK) – What has the team been up to lately?